Floorcovering mills and manufacturers play a very important role in INSTALL. From the start, we benefited from the technical direction and materials support provided for our curriculum, certifications and training centers. We continue to enjoy yearly collaboration with regional training seminars and Train the Trainer courses at the Carpenters International Training Center (ITC). All parties benefit from exchanging industry know-how, allowing us to better serve our floorcovering customers. Proof of this is demonstrated in the INSTALL Warranty Program. Over the last three years, the warranty program has underwritten more than $160 million in floorcovering installations without a single claim against the work. E.J. Welch Co., a Midwestern floorcovering distributor, conducted a study and determined a 900% increase in floorcovering failure when the installation is not conducted by an INSTALL certified contractor. I am pleased to report that our partnership continues to thrive. In 2016 alone, Tarkett, Gerflor, USG, UFloors, Ardex, Armstrong, Turbo Tools, Schluter System, SIKA, Duraflex, HTC, Protect-All and Armor Lock are hosting seminars and Train the Trainers events at the ITC and our regional training centers. These training sessions provide us with updates on new materials, installation techniques and certifications. 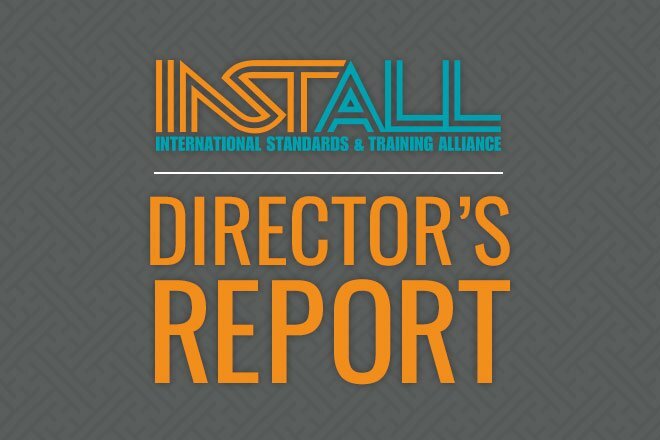 In turn, our instructors and installers provide insight on research and development and serve as a reliable distribution system for manufacturer training and certifications. Additionally, we are happy to announce our partnership with Mohawk at NeoCon 2016.